A local chef and business owner, Taylor Mason and his wife LeeAnn, wanted to open a second restaurant but couldn’t find a space large enough, within the city, to build it. TONO Group self-developed the building at 436 West James Street, making use of the existing infrastructure, which provided him space to open an old-world Italian wood-burning kitchen and bar—and also serve as TONO Group’s offices. Projection LUCA 4,200 SQ. FT. BUILDING 13,200 SQ. FT. The building, located in a residential neighborhood, gained a second life through creative re-use and helped engage and unite the neighborhood. By adding a glass garage door that opens to patio seating, it creates a friendly streetscape—reminiscent of a piazza. Additional interior space was added by building a mezzanine with a steel and timber frame—exposing the original timber trusses. The beautiful 1944 hardwood floors were refinished and existing wood and doors used throughout the space. Natural daylight was added to contrast manmade and natural materials. Finally, an open kitchen was created for diners to have a full sensory experience. 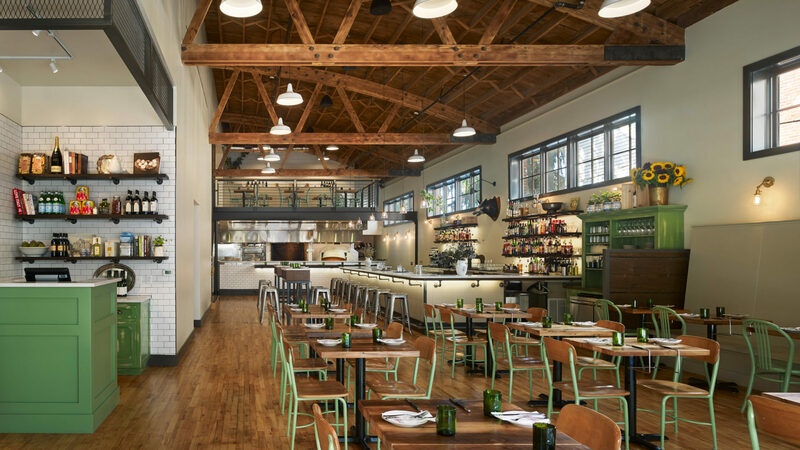 The restaurant is a hotspot and has served as a community gathering space—exemplifying the revitalization of the neighborhood through creative adaptive re-use and redevelopment of a blighted building.